It’s my absolute pleasure to tell you about one of the amazing companies with whom we here at Everything Summer Camp have the absolute pleasure of doing business. At twenty-six years old, some might consider Everything Summer Camp a young company. But that’s nothing compared to our friends over at bobble. If we’re young, then bobble’s a baby. It was only three years ago that they got started. And since 2010, bobble’s retail network has grown with ferocity! You can find a bobble water bottle in more than 35,000 stores across each and every one of the United States. They’re in nearly thirty-five countries spanning five continents! In only three years, bobble has sold millions of water bottles the world over! The good folks that work at bobble are like-minded, creative individuals with a love for design and the planet. Their reusable, filtered water bottles both change people’s drinking habits for the better and help to remove millions upon millions of discarded, single-serve, plastic water bottles from our planet. 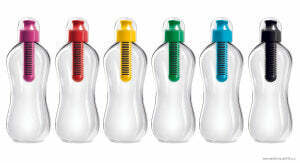 bobble has given the world a sustainable, reusable, portable, filtered water bottle. bobble makes a good point that tap water, unfortunately of wavering quality, has become a second-rate source of water despite the fact that it’s free and widely available. The smart design of a portable, filtered bobble water bottle is you can still use tap as a source of water without concerning over the water’s purity! Single-serve plastic water bottles all sell nothing but the concept of pure water. But you don’t know that bottled water is really any purer than the tap that comes out of your faucet! That’s why the filter is kind of ingenious! After achieving so much in their first three years, you might wonder to yourself, what else can they do? Thanks for reading, Camp Fans! Till next time.